The benefits of IF are endless! The ones most commonly seen are increased energy, decreased fatigue, better sleep, fat loss, & increased metabolism. 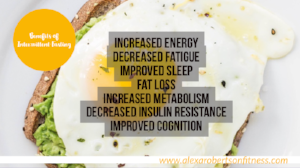 Research has also found IF to make us less insulin resistant which is incredible for those with diabetes and/or PCOS that have struggled to lose weight in the past! IF can also help with improving cognition, memory, & clear thinking! The key to benefiting from intermittent fasting is to follow a plan that is research based, monitored, focused, & gives you plenty of healthy foods! IF is one of the key strategies in my “6 Week Shred” program! Check it out now & message me with any questions! My main focus is for all of you to be able to enjoy your life while still being able to reach & maintain your health & wellness goals! Let me know if you try any of these out! Make sure you’re following me on all of my different social media channels & website to continue to receive all of my articles, ideas, recipes, etc! And, as always if you benefited from any of these tips...I would love for you to share with your friends as well! “6 Week Shred” & Intermittent Fasting RESULTS! FIT exercise into YOUR busy life! Don't "FALL" into the trap of weight gain this year!